The Synagogue shooting happened Saturday and shots were fired just a little before 10 AM. The shooting happened just 6 blocks away from Heinz Stadium. 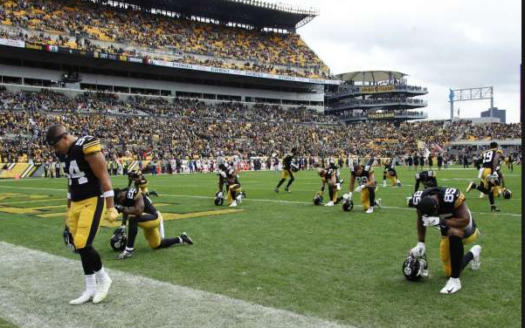 The Pittsburgh Steelers head coach Mike Tomlin said he lives about 800 yards from the Church. The very next day the Pittsburgh Steelers went on to face the Cleveland Browns on Sunday this was a huge game for the Steelers so people can try to get their minds off of this tragic event. Before the game started the Steelers had a moment of silence, also in tribute to the victims they made a slight change to the logo to a yellow shape into a star of David and added the words “stronger than hate.” There was also a kid in the stands who had a patch of this new logo on his jersey. During a press conference (and later reported by Fox News), Mike Tomlin said, “I’m a member of the Squirrel Hill Community, personally.” Fox News also stated that the Steelers owner Art Rooney said,”our hearts are heavy, but we must stand against anti-Semitism and hate crimes of any nature and come together to preserve our values and our community.” The Pittsburgh Penguins also chipped in and donated $25,000 to the Jewish Federation of Greater Pittsburgh and they are also going to donate another $25,000 to establish a fund with the city’s Department of Safety for the four Pittsburgh police officers shot and injured on Saturday.